This is the Mini Libraries series. The favourite writers of all the time has been Cloudsfactorized and reduced in a mini version! 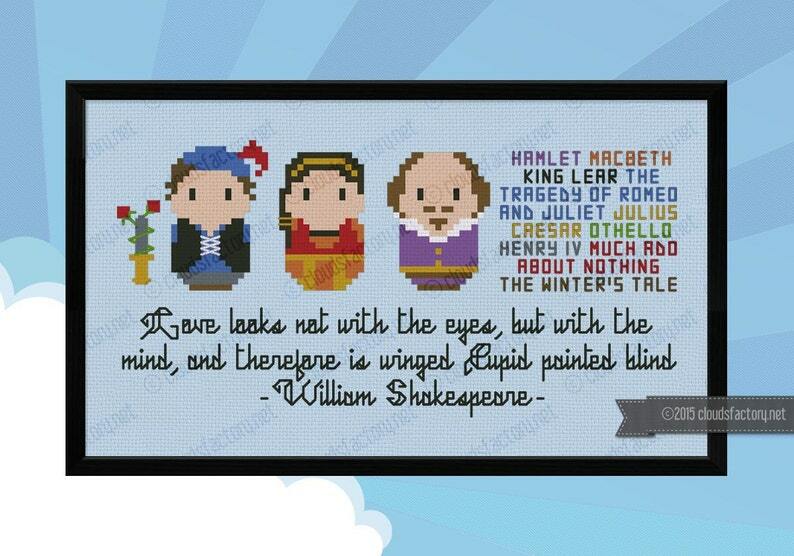 This pattern features William Shakespeare together with Romeo and Juliat, some of the book titles from the Shakespeare's bibliography and the quote "Love looks not with the eyes but with the mind and therefore is winged Cupid painted blind"
This is an INSTANT DOWNLOAD. The digital file will be delivered instantly via download link once payment is processed. The pattern can also be accessed at any time through your "Purchases" folder. If you have problems downloading the file, feel free to contact me! When I was a child, my daddy used to read Edgar Allen Poe stories to me as bedtime stories. Odd, I know....but I have such an appreciation for his work now! I bought this pattern to make into a bookmark for my dad! You can download your files once the payment has been cleared going to You > Purchases and reviews and looking for the order. There you can find your "download" button. Please consider the Etsy has not implemented the button on the app yet, so if you're using a smartphone or tablet, you have to use your internet browser to connect to the website and download your files. Please note that if you paid with E-Check, Paypal requires 5-7 days to clear you payment. Then your item will be automatically available for download.